The Bissell Spotlifter 2x Portable Deep Carpet Cleaner (1719, 1719Z, 1719T) is a lightweight, compact cordless cleaner for cleaning carpet spots and stains. Although it is a small inexpensive cleaner, it has the full functionalities of a carpet extractor. The machine incorporates both suctioning and brushing mechanisms to lift out dirty spots and stains. This rechargeable handheld device will run at full power for up to 15 minutes. It is intended for use in cleaning carpet spots and emergency spills, without being restricted to a cord. Note: This model may not be currently available. For alternatives, check out the corded Bissell SpotLifter Powerbrush Handheld Deep Cleaner 1716/ 1716B or the newer Bissell Pet Stain Eraser Cordless Portable Carpet Cleaner. Like other portable carpet cleaning machines, this model is popular for homes with pets and young children, where carpet accidents happen every now and then. It is also frequently purchased for cleaning auto carpets and upholstery, as it facilitates auto interiors cleaning without needing for the machine to be plugged into a power source. Lightweight, Cordless, and Highly Portable – The unit weighs less than 6 1/2 pounds and measures approximately 17 3/4″ by 7′ by 10′. A carry handle is integrated into the unit. The Bissell SpotLifter 2X 1719Z is especially convenient for removal of spills, spots or stains from carpets at home, especially in households with pets, toddlers or small children, where a lot of carpet accidents/stains/spills can occur. Deep Carpet Extractor – This is a small portable carpet extractor that works along the same principles as the bigger home carpet cleaning machines. There is a sprayer to spray the cleaning solution and water mix on spots and stains, a scrub brush to scrub dirt and stains off the carpet fibers, and finally the machine will extract the dirty water out. 9.6 Volt Battery – Although its intended use is for smaller areas of carpeting, the power delivered by the 9.6 volt battery provides sufficient suction. 3 Inch Cleaning Nozzle – According to Bissell’s specifications data, the Bissell Spot Lifter 2x has a cleaning path of 3 inches wide. The scrubbing brush is stationary and not motorized, ie. it will not automatically rotate on its own. The scrubbing is done when users move the carpet cleaner back and forth. The brush can be removed from the unit for maintenance cleaning or future replacement. 8 oz/ 12 oz Water Tank Capacity – The Bissell cordless 1719 spot cleaner comes with an 8 oz water tank capacity for clean water and 12 oz dirty water tank capacity. Dual Tank System – The Bissell 1719/ 1719Z cordless cleaner uses a two-tank system: one chamber for filling in the clean water, and the waste water is then collected in a separate chamber. Battery Charging – Bissell recommends the battery should be charged for a 12-hour period before initial use, and for a 12-hour period if the battery has been allowed to discharge completely. Easy to Read and Follow Instructions – The instruction manual is well laid out. It gives clear, detailed instructions on preparing the Model 1719 for use, for its operation, and for its cleaning and maintenance. 1 Year Limited Warranty – The warranty covers damaged or defective parts, which will be repaired or replaced free of charge as long as the damage has not been the result of misuse or negligence. Model Variations – Th Bissell Spotlifter 2x Portable Carpet Cleaner comes in several related models like the 1719, 1719Z and 1719T. The main differences has to do with the color of the unit and minor changes in cover design. The 1719 is Amethyst, whereas the 1719Z is Red. Target has a listing for the Bissell Spotlifter 2X Essential Cordless, Rechargeable Spot Cleaning Machine, which is Red. This is a convenient and relatively inexpensive cleaning device to have handy for cleaning up emergency spots, spills, and pet messes. The suction has been significantly improved in comparison to older models of the same type. Some people wonder if this appliance will really help them compared to just purchasing a carpet spot cleaning solution and then using a scrub and towel to clean up the mess. The answer is an emphatic yes, because the machine will suction up the dirty water – a messy colloid of carpet cleaning solutions, dirt and stain particles. Compared to using a brush and towel scrape and blot up the mess, users actually get a lot more dirt extracted out of the carpet. The Bissell 1719 cordless cleaner is ideal for cleaning up spills before they have time to set in. It needs to be kept charged of course. It cleans and dries in a single step, using a combination of water and cleaning formula, a trial-size bottle of which is included. Operation is simple, the only controls being the power switch and spray trigger. A third button is used to release the collection tank to empty dirty water. Pet messes like diarrhea, or peeing may happen now and then, but they seldom happen according to a fixed schedule, making the Bissell 1719 a useful device for pet owners to have one hand. The fact that it works so effectively on both carpeting and upholstery makes it a great stress reducer. While it is very effective in cleaning up fresh spills and messes, it can also be used effectively in older spills and stains that have had a chance to set. This cordless cleaner is great for auto upholstery since there does not have to be a power outlet in the vicinity. The only time a cord is needed is when the battery is to be recharged. Many users also like how well they can clean their love seats, sofa and carpeted stairs with this small lightweight device. According to the user manual, the Bissell SpotLifter 2X 1719 spot cleaner can be used for cleaning hard surfaces as well. A number of users mentioned that they experienced great results using it on tiles. Although maximum cleaning time is about 15 minutes before the battery discharges completely, the highly maneuverable unit cleans spots and spills quickly and efficiently. It can handle a number of spots and stains in a relatively short time. A surprising level of cleaning can be done within 10 to 15 minutes time-frame. One user was able to clean 4 car seats in a 15-minute setting. For cleaning up small stains/spots, the device can be used numerous times before it may become necessary to completely recharge the battery. If you want a similar handheld unit that is not limited in its cleaning time span, consider getting a corded unit like the Bissell Spotlifter Powerbrush 1716. The Bissell SpotLifter 2X Portable Deep Carpet Cleaner retails for around $50. This makes it one of the least expensive carpet extractors around. This portable unit is extremely easy to use. The instruction manual is quite specific and very helpful in this regard. About the only negative is that some users have indicated that cleaning out the dirty water tank can at times be a bit of a chore. For more comparisons of the Best Handheld Carpet Cleaners, check out our post here. Compared to other portable carpet cleaners, this model is smaller and less powerful. It does an excellent job for what it is advertised as. But being a compact cordless device, it does have limitations on how much it can do. Some shoppers express concern about the 15 minute operational time, and worry that they cannot complete their cleaning in time. There is certainly a trade-off between cordless convenience and incorporating more power and features. You can compare this with the Bissell 5207A, which is corded cleaner. 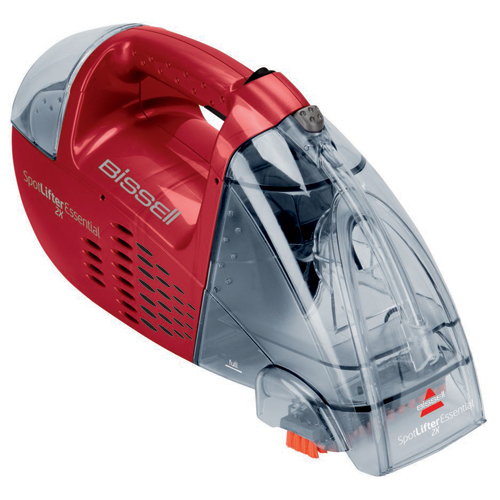 The Bissell 5207A has more power, a larger tank capacity and a more flexible cleaning handtool. The rechargeable battery is a nickel cadmium (Ni-Cad) battery, which has an average lifespan of 5 to 7 years. This battery is not replaceable, in the sense that Bissell does not list this as a spare part, nor provide specifications on purchasing a replacement. There are some complaints regarding how the battery is no longer recharging after a year or two of use. Sometimes, it could be an issue with the recharging cord. If it’s a matter of the battery itself going bad, then the user may be out of luck. Water may spit out of the unit when the dirty water tank is full; otherwise, it is usually not a problem. Always test a small hidden/unimportant spot on the carpet or upholstery before proceeding. When cleaning upholstery, check the tag on it. It is says “W” or “WS,” it’s generally safe. It the tag says “S” or “Dry Clean Only,” it’s best not to clean the upholstery with this cleaner. While the scrubbing brush is effective in removing deep-down dirt, it is stationary and doesn’t move by itself. You have to move the entire unit to get scrubbing action. For some tasks, it might even be easier to remove the brush and use it separately. However, when you do that, make sure that you have detergent solution already sprayed on the carpet. If you scrub the carpet without adding any cleaning solutions, you risk scrubbing the dirt deeper into the carpet. Should You Buy the Bissell 1719 SpotLifter 2X Portable Deep Carpet Cleaner? The Bissell SpotLifter 2X 1719 is affordable and well worth the price if you have a need for a highly portable and cordless carpet stains cleaning appliance. This model works well, just as advertised. It is designed for small tasks and it would not be suitable for cleaning large carpeted areas or entire homes. Tired of Dealing with Carpet Stains? Not sure if the Bissell SpotLifter 2X Portable 1719 is right for you?Learn more about the Best Handheld Carpet Cleaners. Check out other top choices in the Portable Carpet Cleaning Machines Reviews section, where you can compare the Bissell 1719 with other compact portable carpet spot cleaners such as the Bissell Pet Spotbot or Bissell SpotClean 5207. This was such a waste of money! It does NOT have any suction power at all and it only works for 15 min then you have to charge it again for 12 hours! Im taking mine back today, really disappointed. Sorry to hear your experience. This is one of the smallest units and meant for small jobs. Bissell offers more powerful units like the mid-range Bissell SpotClean Portable 5207. It’s also corded.